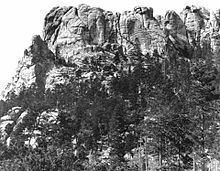 Six Grandfathers Mountain, now known as Mount Rushmore, was spiritual home to the Lakota Sioux Indians. Many of the Sioux were insulted by the building of the Memorial on their sacred land. Add to that the fact that the monument celebrates the Europeans, who killed so many of their tribesmen as well as appropriating their land, and it is no wonder there is still controversy between the Sioux and the US government today. For one hour each evening, Mount Rushmore, The Presidents’ Mountain, is illuminated with steadily increasing lights that make this carving glow in brilliant splendor. 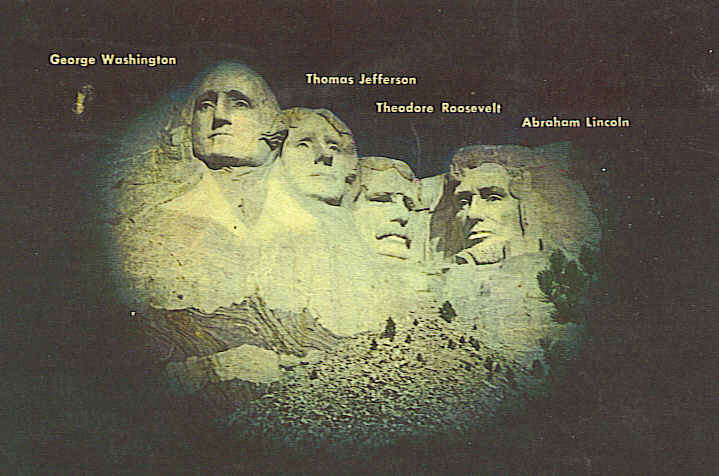 The four presidential faces shown on this 1989 postcard are from left to right: George Washington, the father of our country; Thomas Jefferson, principal author of the Constitution, and instrumental in the Louisiana Purchase; Theodore Roosevelt, champion of conservation; and Abraham Lincoln, leader during the Civil War. Today we can see the results of Gutzon Borglum’s guidance of approximately four hundred workers, including his son, from 1927-1941. 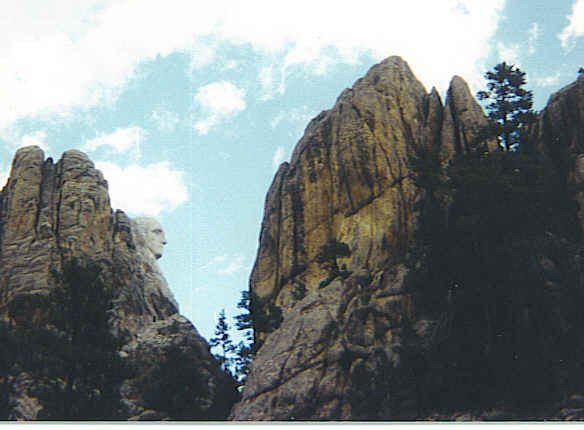 The four sixty foot likenesses of the faces rest on 1,278 acres. Original plans were to sculpt them down to the waists, but that idea was cancelled due to insufficient funds. Upon his death, Gutzon’s son, Lincoln Borglum, was in charge of completing the project, but he basically left it as the monument appeared upon his father’s death. Today you can visit the Lincoln Borglum Museum where a film provides an introduction to the memorial site plus historic exhibits. Take a lunch break at Carvers’ Cafe where you might find on the menu tasty dishes such as Jeffersonian Gourmet Salad or Teddy’s Bison Chili. If you are lucky, you can sit at a table by the large wall of windows, which provides a great view of Mount Rushmore. The Sculptor’s Studio displays the unique plaster models used prior to sculpting on the mountain side, as well as the tools used while carving. A recent addition is the Native American Heritage Village devoted to Indian culture and the Indians’ place in local history. 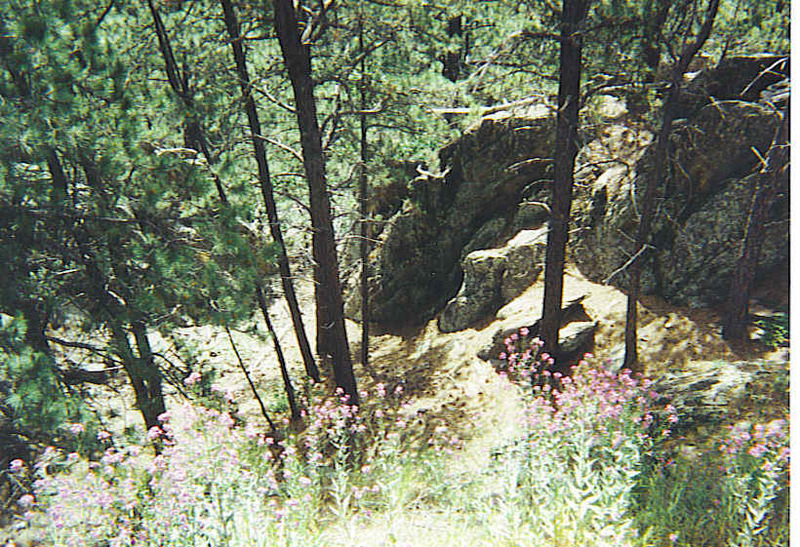 For another close-up view of the mountain, take the scenic chairlift ride through the Ponderosa pines. Views are spectacular and there is a park at the summit as well as a small outdoor grille. 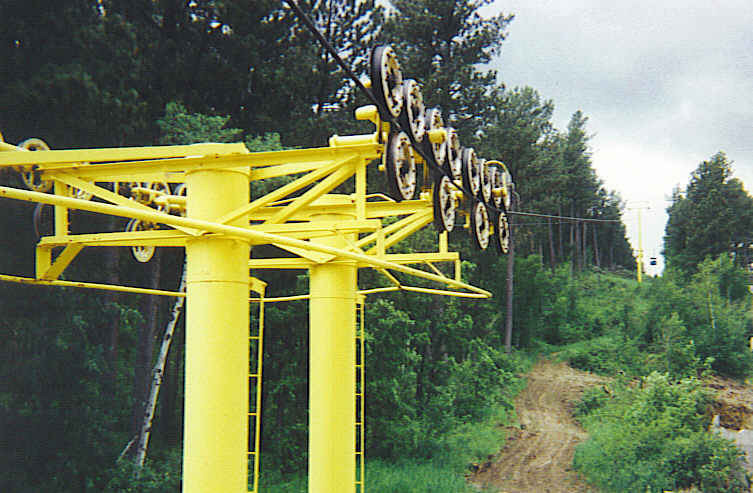 You must be careful getting on and off as the chairlift stops for no one. You do get a unique view of the presidential faces as well as enjoying the feeling of flying up the mountainside on the chairlift. Coming down you can either return on the chairlift or descend on the Alpine Slide. This new slide is 2000 feet long and you are able to control the speed downhill on a wheeled sled with brakes. So it is up to you! Either take a slow and leisurely ride down, or get a rush of excitement. On the side of the mountain behind the faces is an interesting tunnel called the Hall of Records. In 1998, they began construction of a vault there that would hold sixteen porcelain enamel panels. On these panels are: text of The Declaration of Independence, Constitution, biographies of the four presidents, and a short history of the United States. All this is being done to preserve our present history for future generations. At this time, the Hall of Records is not accessible to the public. Here at Mount Rushmore, you and your family can have a great educational experience by learning about the Indian heritage as well as the significance of the four faces carved there. Leaving the park, there was an interesting view from the back road where it appeared that George Washington was keeping watch on everything with eyes eleven feet across. The pupils of each eye are made of granite so they appear to twinkle when the sun hits them. Maybe that is the reason the eyes seem to follow you! Join the nearly three million people who visit here each year to see the faces march along the skyline. Mount Rushmore Memorial in western South Dakota can easily be reached off I-90 off Exit 57 to Highway 16, which goes to Keystone. At Keystone take Highway 244 to the Mount Rushmore entrance. When the easily recognized figure of Abraham Lincoln appeared, complete with top hat, he was greeted with a standing ovation. 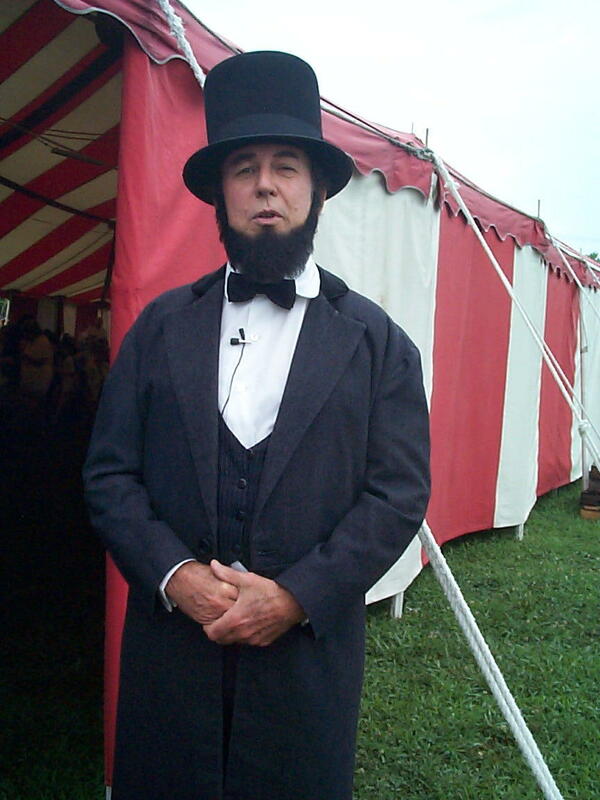 Dr. Richard Johnson, Professor Emeritus at California State Polytechnic University, became for the evening a very believable Abraham Lincoln. 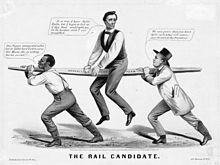 The Republican party chose Abraham Lincoln as their candidate for president because he was a great spokesman and a moderate candidate, who they felt could get a lot of votes. During his election campaign, an eleven year old girl wrote to Mr Lincoln stating that she felt he would look much better with whiskers. Lincoln answered her letter but made no promises; however, shortly thereafter began growing his beard, which is a familiar part of his image everyone recognizes today. 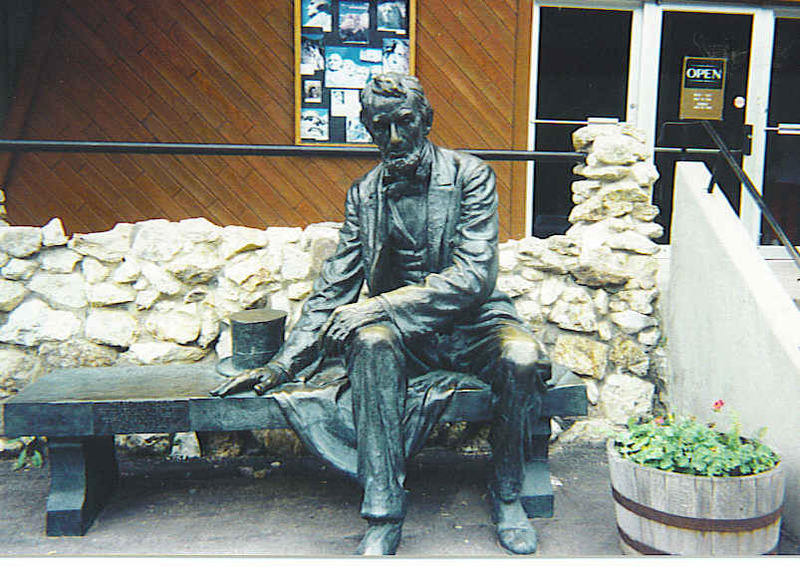 His wife and sons played important roles in Lincoln’s life. Mary, his wife, was an ally in Springfield, but in D.C. was not a good advisor. This perhaps due to the death of their son, Willie, which devastated Mary. At this point she attempted to gain comfort from spiritualists and even conducted seances in the White House. The evening under the Chautauqua banner would not have been complete without the now famous Gettysburg Address, which received another standing ovation. Later Lincoln said that he composed it in no more than seventeen days, and was actually still working on it when it was delivered. His career advice to those entering the legal profession seemed very practical: Try to be an honest lawyer. Be honest in what you do. Be respectful of others. Help them when you can. Very simple advice, but still a wise lesson for us to follow today… as it was for Honest Abe. 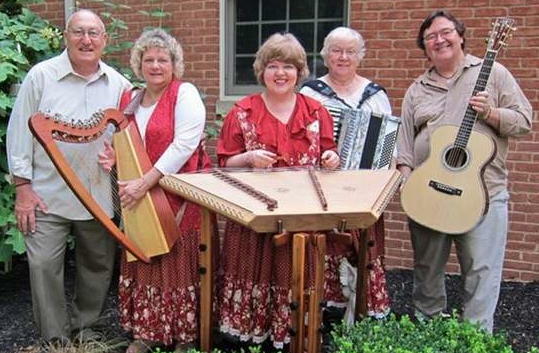 Every summer the Ohio Humanities Council in conjunction with Ohio State University’s Humanities Institute provides compelling first person historical portrayals around the state of Ohio. Tune in again next summer for another exciting line-up of influential figures in our country’s history.